Free Music Gift Catalog from Music Treasures: Gifts for Musicians and Dancers! Music Gifts | Dance Gifts | Music Treasures Co. The 2014-2015 catalog shown below was our last publication. After 46 years we have decided to drop the direct mail program and migrate to an electronic platform for our product presentation. The rising production cost, mailing cost, product volatility and constant price changes made it impossible to provide an accurate product print presentation. We intend to update on-line pricing every 24 hours and add new products as soon as they arrive. We encourage you to sign up for our e-mail program which highlights new product announcements, promotes seasonal events and offers money savings discounts. Sign-in now to our "OPT-IN" e-mail campaign so we can stay in touch. We still have our customer service staff available 9AM-5PM, M-F, EST to assist with your order or answer any questions. Call 1-800-798-8613 . For new products, specials and discounts, get on our EList! 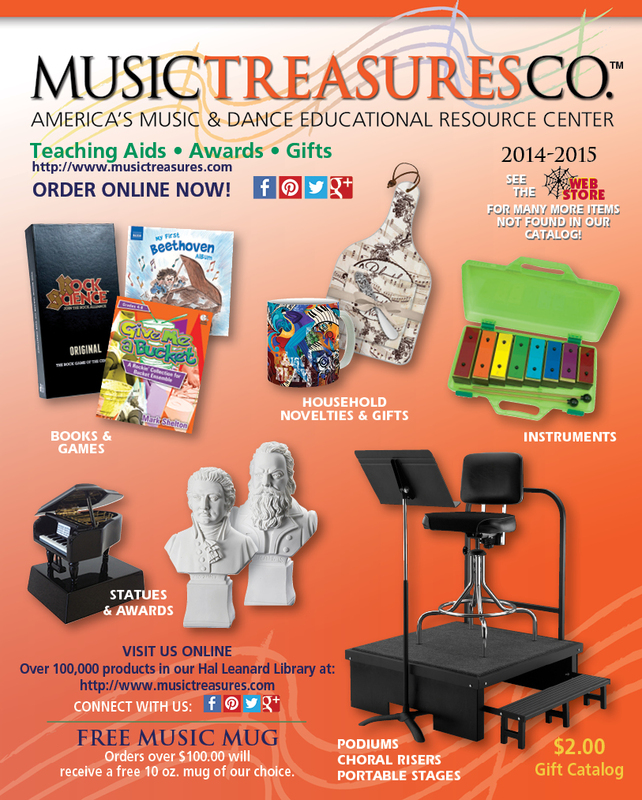 Download or view online the 2014-2015 Printed Music Gift Catalog! Click on the catalog below for the .pdf version! Or click on the catalog below for the flash version!